Akino Miyagi, a researcher who belongs to the Butterfly Society of Japan, discovered about 50 pithecops corvus ryukyuensis at the Arakawa River basin in Takae, Higashi. This butterfly has been designated as a near threatened species. 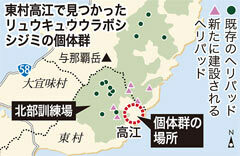 The area surrounding Takae is affected by the construction of six helipads that are related to the partial return of the U.S. Northern Training Area. Last October, Miyagi found the pithecops corvus ryukyuensis. This species of butterfly is on the Ministry of the Environment’s red list as a near threatened species and lives only in Iriomote Island and in the northern part of Okinawa known as the Yambaru. 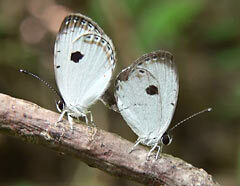 Since she discovered the butterfly there, Miyagi has carried out surveys three or four times a week at Takae. She said that if the construction is carried out and if the Osprey aircraft operate around the area, “the habitat for animals and plants in the forest would be cut in two.” The downdraft from the aircraft may cause “dry areas to spread from one to the next and result in a negative impact on animals and plants. The damage could exceed human expectation. With regard to the pithecops corvus ryukyuensis, Miyagi said, “Caterpillars are preparing to fly in autumn. We must not destroy the natural environment of the Yambaru.” In the Final Environmental Review that made mention of the environmental impact of the Osprey, the U.S. military admit that among the possible effects on animals and plants that Okinawa rails might abandon their nests. However, there is no mention of insects such as butterflies in the review. To protect the rare pithecops corvus ryukyuensis, Miyagi took part in the protest movement against the construction of helipads and raised the issue of the butterfly with the people who oppose the construction. Environmental disruption threatens the survival of the pithecops corvus ryukyuensis. Joji Otaki, who is an associate professor of the Faculty of Science at the University of the Ryukyus and a researcher of the pithecops corvus ryukyuensis, commented, “Pithecops corvus ryukyuensis is a precious species of butterfly that lives only on Iriomote Island and in the northern part of Okinawa. In addition, there are very few of them even in that habitat, so a group of these in Takae is very valuable. Because this species of butterfly is found on the forest floor near clear streams they will suffer damage directly if the balance of the natural environment is compromised because of military activities. The destruction of the environment caused by bases and flights may threaten the survival of this precious species of butterfly.